That two armed terrorists slinging Ak-47s can inflict that kind of slaughter on a site that was already under police protection (that satirical paper had received numerous threats), murder 12 people there and then escaped unscathed… parade around Paris, to resurface later and take more hostages… alive 3 days later is unbelievable. It points to the height of incompetence and Frances’ inability and/or unwillingness to confront the Islamist enemy that has engulfed it. I have spoken about this unwillingness at length elsewhere. Less than two months ago, Jerusalem suffered a similar attack when two armed muslim terrorists attacked a synagogue in the neighborhood of Har-Nof and killed or wounded a score of unarmed praying civilians. A Druze police officer who arrived at the scene first was also mortally wounded. Two traffic cops in the vicinity quickly arrived, engaged the two scumbags in a gun fight and a third officer who arrived quickly shot and killed both terrorists. The incident, though ghastly in its death-toll, was over in minutes… long before any special forces even arrived. In Israel, thankfully at least this remains the case, if you show up with AK-47s trying to shoot at everyone, one thing alone is certain; you will be dead or under arrest (most likely dead) very shortly after you chose to start pulling the trigger. This is less likely in other socialists countries such as France, where only terrorists and criminals have access to firearms. At the same time, that France like other western countries unarms its own native populations, it invites massive amounts of hostile foreigners who are quickly overwhelming it. There is nothing shocking about yet another Islamist terror attack, that can only be news to those who remain fixated on ranting about Islam the “religion of peace” and how the west is not or should not be at war with it. The victims of the 3 days of terror in France were men and women, young and old, Jew and Christian, and the only thing that the victims shared was that they were not Muslim (yes apparently a few non muslims are still to be found in France!). 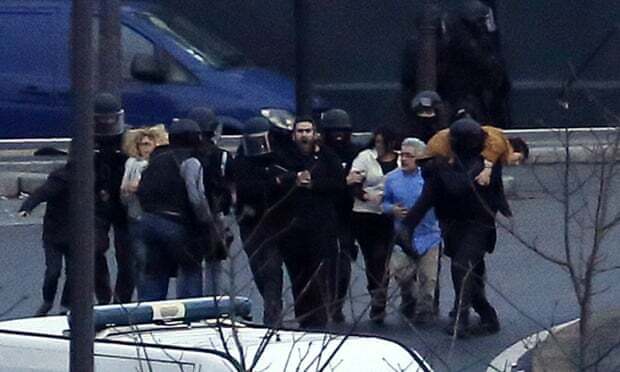 What is shocking here was the level of incompetence from France’s security forces, and the incident makes me wonder if then 100 AK wielding Arabs would have then conquered France? Tactical reaction aside (and as of publishing early reports are saying the last raid was successful and hostages freed… I very much expect that the percentage of hostages lost in the kosher market are very high though I hope to be wrong), perhaps France and the rest of the appeasement-loving west should take note that something is odd here… France who opposes Israel at every opportunity, who opposes US global policies, who invites countless thousands of legal and illegal muslim immigration to its shores, a France that taxes the “evil” wealthy and wealth creation to the utmost extreme in order to provide socialist “justice” for all its citizens, foremost the large waves of legal and illegal muslim immigrants, a France that just days ago voted for the recognition of a palestinian state in the UN; why is this same France subject to ravaging terrorist attacks? Why do these Islamists not instead embrace and love the country that embraces them and every anti-western policy it can? Is there something the leftists are not getting here?? Yes indeed there is. And while they continue to bury their heads in the sand the enemy, who lives in a dimension where liberalism and leftism does not apply, exist or even compute, marches on, meter my meter on its march to the West’s demise. De Gaulle famously said that France has no friends, only interests… (when it changed sides from ally to Israel to opponent when he smelled the winds changing and France was leaving north Algeria and north Africa), in that case it behooves them to take not of those interests over their unflinching declarations that they are friends to the east, to the Arab world and to the Muslim world. If it is not too late… perhaps that last opportunity went with the 2002 election with Le Pen whom the Jews so significantly helped defeat (and subsequently ran from France to Israel when much of his predictions came to be). Here in Israel, though more aware of the risks of the situation, the majority of the population encourages this same march… appeasing ever more than the appeasement that it criticizes Europe for, and yearning in the same way if not much worse, for acceptance from the very Europeans who themselves endlessly crave for the acceptance of the Islamic enemy, and from this islamic enemy himself. The upcoming elections are a chance to do different. In this march, slowly the line is moved in the enemy’s advantage… while the PLO was widely recognized and fought as a terrorist organization, we succumbed to accept them as long as they not be Hamas…. now Hamas itself seems acceptable as long “as please do not be ISIS”… and so we go backwards and downwards while the enemy goes forward and upwards. The credit in cunning goes to them, since it is we who still possess the strength. Would that strength be reversed our days here would be very shortly numbered. Let’s not get to there. I know the ‪#‎french‬ are pretty weak sauce… and have not won a battle since a Corcican led them… but man… all of France can’t take out two guys with AKs in days… amazing. Maybe it’s because there aren’t too many actual French left in France. And those that exist are not allowed to carry arms (that’s a right reserved for criminals and terrorists in leftists countries). It is probably hard for these Muslim terrorists to find their non muslim victims to kill… but so far they’v managed to find about 15…. Men, women, young and old… Jew and Christian, the one thing that united the victims is that they were not muslims. (By the way, Naftali Bennett just stole my line and used that against the witch-like Livni).